Étienne Radet. Photo by Domy2. Here we have the whole history of Radet*. 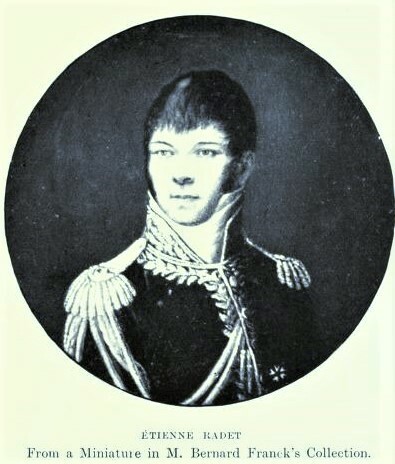 Gillet, the representative of the people, appointed him brigadier-general to the Army of the North, whence he dispatched him as chief of constabulary to Avignon, where Bonaparte, on returning from Egypt, was so much struck with his behaviour that he sent him to Corsica, whence he recalled him to Milan to approach Prince Eugene, who dispatched him to Prince Joseph, who first entrusted him with the arrest of Fra Diavolo, and then sent him to his sister in Tuscany. Here, in June, 1809, he received an order from the Imperial headquarters at Vienna to repair to Rome by forced marches, with four hundred mounted men of the constabulary. At Rome, a terrible task awaited him. On arriving there on the 4th July he learnt from General Miollis, the governor of the town, that his orders were to seize the person of the Pope, who was guilty of having unceremoniously excommunicated the Emperor. Cardinal Pacca, the adviser of the Holy Father, was to be arrested at the same time. 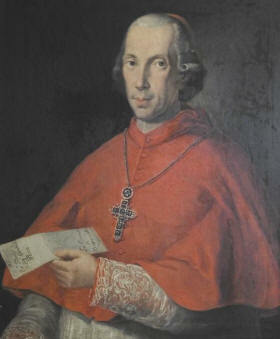 Bartolomeo Pacca, Cardinal and Cardinal Secretary of State, 1756-1844. This time Radet, as he admits himself, was taken aback. He returned to the Rospigliosi Palace, where he was living, and “shut himself up to think.” Never had he so keenly regretted Varennes, and the House on the Hill, and his blossoming orchard, and the quiet fields beside the Aire. He was “oppressed by painful feelings, mingled with fear,” for he had always been a religious and even a devout man, if one may judge by a prayer that he composed, and he was obliged to face the cruel alternative “of either outraging the most sacred rights, or of violating his vows by disobedience.” The result of his meditations was that he returned to Miollis. The latter, who was extremely anxious to transfer the responsibility of this compromising performance to someone else as soon as possible, pointed out to him “that a soldier was above all things obedient, passive, and responsible”; upon which Radet, having nothing to answer, turned upon his heel and retired to plan his method of attack. Pius VII was living at this time in confinement in the Quirinal, with no troops but a few Swiss Guards. He was an old man in weak health, broken down, and always ailing. On that very evening Radet made his arrangements. As soon as night fell detachments of constabulary and foot soldiers were seen going through the streets of Rome with the heavy step and sinister appearance of troops marching without drums or music. The streets leading to the Quirinal and the bridges across the Tiber were silently occupied. The hermetically sealed and barricaded palace was asleep, or seemed to be so. At thirty-five minutes past two in the morning of the 7th July Radet gave the order of attack. While a detachment of thirty men escaladed the walls of the garden with the object of reaching the subterranean passage from the Sainte Chapelle, Colonel Siry, followed by fifty men, entered the building through the window of one of the offices. As for Radet, his intention was to invade the palace from the roof, but two ladders broke in succession, which created some confusion. As the clock was striking three a bell in the Sainte Chapelle began to ring the alarm, and instantly voices were heard to cry ”All’arme! Traditori!” It was necessary to break open the door, and this was beginning to give way when Siry, who was now inside the building, opened it from within, and the soldiers entered the courtyard. Radet, followed by twenty men, ascended the staircase, and by the faint light of the early dawn passed through one deserted room after another till he reached the vestibule of the throne-room, where the forty Swiss Guards who composed the entire papal army were gathered together. These yielded up their arms at the first summons, and as a few soldiers were all that were needed to keep guard over them, Radet pursued his way. 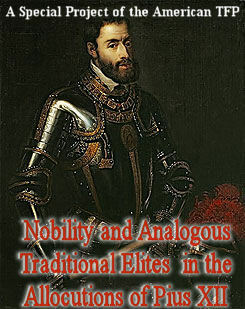 He pushed open the door of the huge throne-room, which was nearly dark and quite deserted. With a bow, the young priest silently stood aside, and Radet, taking a step forward, saw at the end of a little corridor of moderate width a room “in which there were lights and some people standing.” He bared his head instinctively, and approaching the threshold saw the Holy Father in his pontifical robes seated at his bureau, surrounded by a few venerable ecclesiastics. 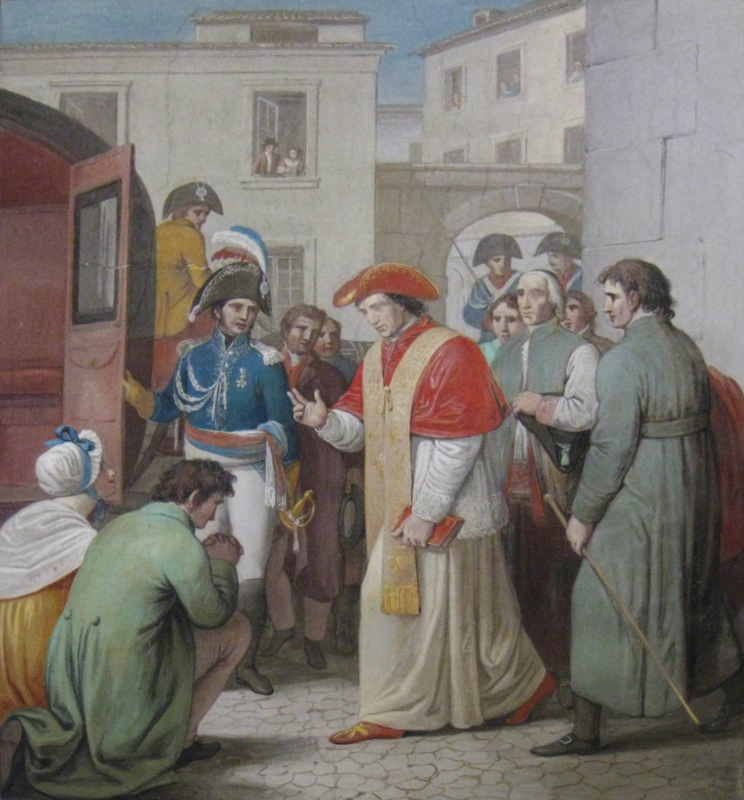 Pope Pius VII giving his blessing before his departure to exile in Savona. Photo by Benoit Lhoest. 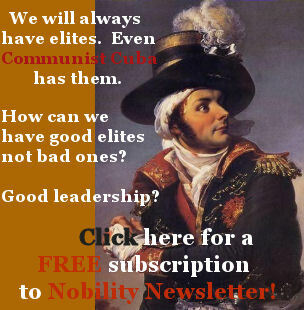 Radet announced his sovereign’s will, to which Pius VII answered, “Nevertheless I forgive him — and everyone! You will surely allow me two hours?” The general was obliged to answer “that the power to do so was not in his instructions,” and the Holy Father, resigning himself, took up a book that lay on his bureau, and rose. Radet went forward to support him, and “was so much moved, so strongly affected by a feeling of veneration,” that he could not resist taking his hand and kissing it devoutly. 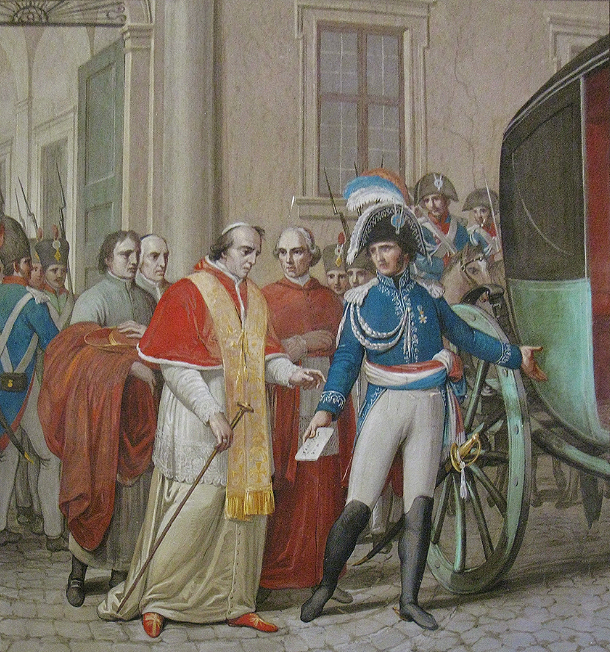 Arrest of Pope Pius VII by General Radet on the night of 5-6 July 1809. Photo by Benoit Lhoest. They then started on their way through the rooms of the palace, Radet holding Pius VII by the arm, and Cardinal Pacca following, escorted by an officer — down the grand staircase, across the court, to the Monte Cavallo gate. Here the Pope paused for a moment and looked out upon Rome. It was four o’clock in the morning; a radiant day was just beginning; in the square there was not a single passerby; in the windows there was not a single face to be seen; only, drawn up in order of battle, stood the rows of troops, absolutely silent, absolutely motionless, blockading the Quirinal. Pius VII raised his hand, and gave them his benediction. A moment later he was borne away in Radet’s berline surrounded by a body of constabulary, on the road to Florence. 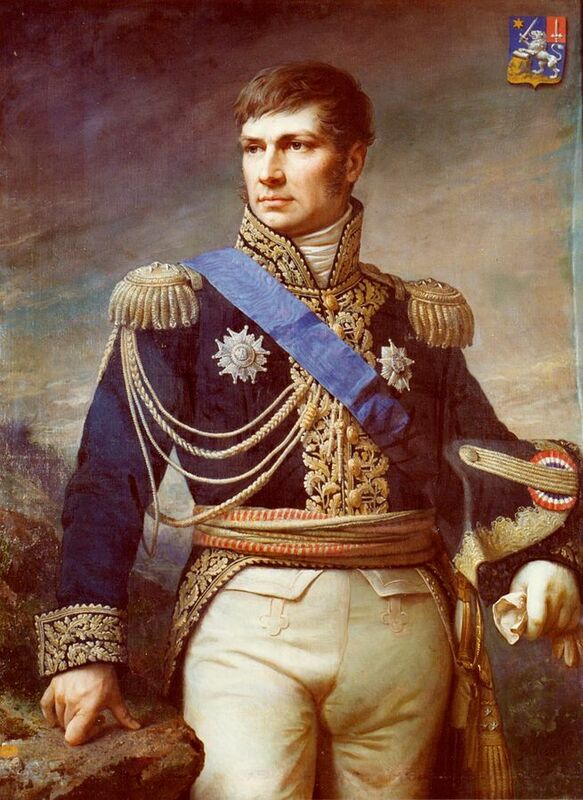 * Étienne, baron Radet (1762-1825) was a French general of the French Revolutionary Wars and Napoleonic Wars.